Home / Needlework / How to make an original lamp from the bottle? How to make an original lamp from the bottle? 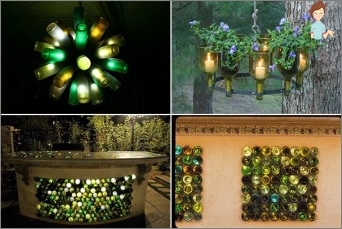 The lamp from the bottle can be a highlightinterior. If you have a beautiful bottle of wine or brandy, do not throw them away: they will be the basis for sconces, floor lamp or chandelier. You will need quite a bit of improvised means, most importantly - that it was the desire and free time. You can make a whole song from the lamps and for this you need two or more identical bottles. 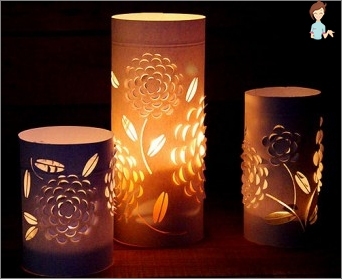 now it is necessary to connect the lamp to a power outlet and enjoy a wonderful spectacle. I must say that this is the easiest method of making. 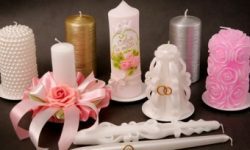 Some go further and inserted into the neck of the bottle candle decorated with composition ribbons, artificial flowers, and others. 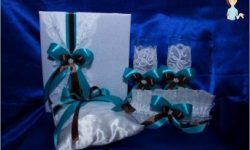 Using glass adhesive can decorateseashells, beads, buttons, in general, everything that comes to you by the arm. You can paint the base paint lamp, but also to put into a picture or any picture. It all depends on your imagination and skill. 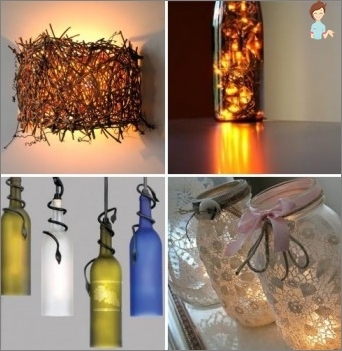 If you have finished the old lampshadelamp, or did you do it yourself of two rings of different diameters, ribs and cloth or paper, you can make your own hands lamp from the bottle in which the latter will act as a support for the lampshade. According to the principle described above, the bottom of the drillempties the hole, insert the wire, one end of which is used for mounting a cartridge with a lamp, and the other will end with a fork. Alternatively, use for decoration decoupage support, painted with acrylic or lacquer. Crafts from plastic bottles appeared in the homes of our citizens with the advent of the sale of drinks in that container. 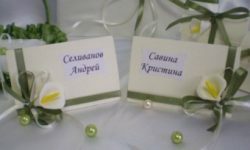 Craftsmen have realized at once that it canIt is an excellent material for the manufacture of various masterpieces of craftsmanship and immediately started to create on its basis vases, candlesticks, ornaments for the garden and even rattles and other toys for children. The most popular lamp made from plastic bottles. Now with glue "The Dragon"Located around the perimeter of your bottlecolorful blank. Can some of the leaves and flowers mounted on pieces of wire and fasten to the bulb. It remains to hang the chandelier from the ceiling, and enjoy the light from the lamp-bottle. You can make a chandelier from the glass ceiling. To do this you need to cut off the neck of the bottle and the bottom with a diamond glass cutter, and then collect them in a beautiful composition. As can be seen, in the manufacture of bottles fixturesno big deal. Having the only glass containers or plastic blank, you can decorate your country home an original masterpiece. With them your design and the interior sparkle with new colors in the truest sense of the word.